“The journey of a thousand miles begins with one step.” Lao Tzu. When, for whatever reason, you have been unable to leave the house and do a simple thing like walk your kids to school or take the dog for a walk even around the block, these much, much quoted words truly resonate…echo. I don’t take that first step, or those first few stumbling steps which follow, for granted. I treasure and appreciate each and every step because even though I am out and about these days, I know they are precious… a veritable miracle. I am as guilty of this as the next person and due to my chronic health issues, operate on a pretty short piece of string these days. One busy day, is usually followed by at least a day in bed. That means that managing my energy levels is quite a balancing act. I can actually be quite well but the chemo treatment around Christmas time, has sabotaged my efforts, leaving my memory shot and my time management abilities non-existent. It’s been quite difficult even getting the kids out the door to school. Strangely, while I’ve been struggling with so many things, I’ve ironically been doing my best writing ever, so things don’t always make sense. After sleeping away most of yesterday after a big day Thursday, I woke up full of beans this morning and made us all traditional porridge and decided to walk to the shops to buy the ingredients for the pumpkin soup I planned to make for lunch. Pumpkin Soup is Mister’s absolutely favorite and yet, no doubt due to my difficulties cutting up pumpkin due to my muscle disease, I have never made it for him and he is now ten years old. We have been doing our home cooking project for 6 months now and while I’ve been intending to make it all along, it’s taken a long six months and many detours to get there. 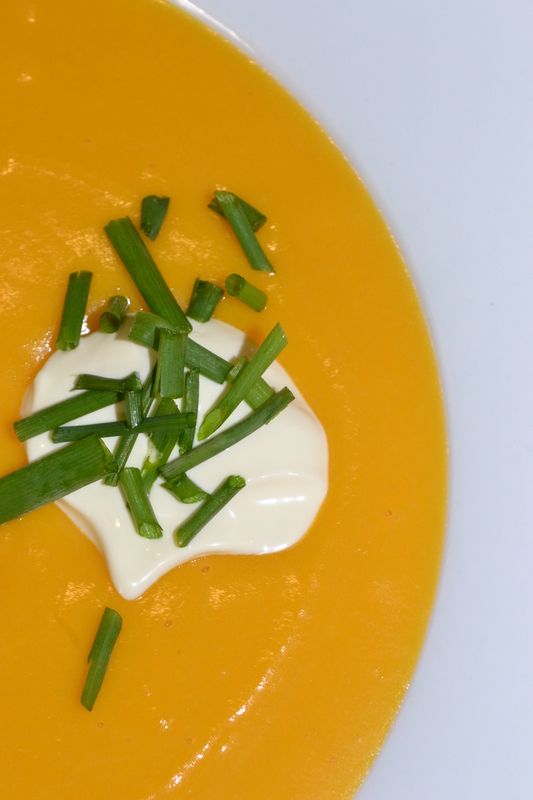 Winter has also set in and so it really is soup weather. Hot soup doesn’t quite seem right in a hot Australian summer! This walk wasn’t quite as straight-forward as it seems. There was myself, two kids and the dog along with my walking stick and the shopping cart. I used to walk down to the shops with dog, pram and toddler detouring via the beach before the auto-immune disease was diagnosed. I was actually doing these walks right up until I was hospitalised because I was thinking that if I didn’t use it, I’d lose it so the worse I became, the more I walked and the worse I became. Not good! 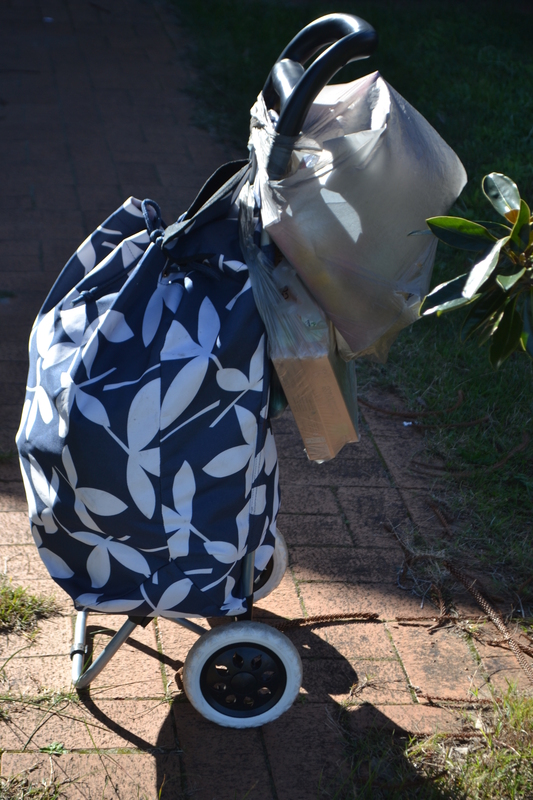 I can’t remember the last time that I walked to the shops with the kids and the dog and we also took a trendified version of one of a granny shopping cart with us so we could get all our groceries home. My husband usually does the shopping at night on his way home from work without the kids. This has been a very conscious and deliberate strategy for us as the kids have been difficult enough without the added pressure of taking them to the supermarket. But they are growing up. They’re no longer in the terrible twos and you would hope that by ages 10 and 8, that they could possibly be useful in the supermarket instead…and they were. Walking along, Mister took the dog. Miss took the shopping cart and I had my walking stick…just to be careful. I still haven’t recovered from my last fall and finished the antibiotics this morning. Yes, my grazed knee became infected thanks to my immune-reducing drugs. I don’t need another fall! I also wanted the kids to have the educational experience of going to the supermarket and looking at the fruit and veg in particular and being part of the selection process. This was quite helpful as I have a lot of trouble finding foods which our kids actually eat and they both added healthy choice to the cart such a mandarins which are also in season. Another reason for walking to the shops, is that I am starting to talk to the kids about reducing our food miles. Buying Australian fruit and veg is good but I am becoming more conscious of what we are eating to the point of trying to buy food which is grown in our local area. However, the easiest way to start reducing our food miles is to walk to the shops instead of driving the car. Depending on my energy levels, this is something we can change relatively easily and the dog will also thank us. He has been going for “walks” in the car unless we are on holidays where he can run freely at the beach. He is a big, burly border collie and historically he’s been very difficult to manage on walks. I couldn’t help feeling like some amazing explorer as we set off. The shops are only about 400 metres away, including Woolworths and Aldi. It was hardly a remarkable adventure but for our family it meant erasing a very definite line in the sand and being free to go. Of course, our walk wasn’t incident free but instead of Mummy falling over being the challenge, it was the dog. The dog often ignores us completely at home, earning him the title of “snob dog” but take him to the shops and tie him up and he turns into absolute jelly and he’s crying, howling, barking. You could say “Not Happy Jan!” He attracted quite a lot of concerned looks and pats as well as a few raised eyebrows and the kids took turns comforting him. He seemed to be alright when he could see me but was otherwise a blubbering mess…dreadful separation anxiety. We also had a few extra purchases on route. My daughter has a thing for presents and after good school reports for both kids, I indulged a little. These are all lovely reasons for going for a family walk but our walk also had a much more serious undertone. While everybody needs to exercise for about 30 minutes per day, for me this exercise is potentially a life-saver. Exercise prevents chest infections, which could very easily lead to pneumonia or worse. Exercise, along with getting a bit of sun (I am not allowed to get a lot of sun) is also very good for my mental health and fighting off the infernal black dog which has been creeping up on me lately. My recovery is taking longer than expected and I keep battling with all the chaos of chemo brain, infected knees and…life. By going walking with the kids, I am spending time with them while getting my exercise and they are also with me if there’s a problem. We also had my phone and my husband, who was at home working on the car, was prepped to come to our individual or collective rescue but only needed to help us get our rather overloaded shopping cart back inside the house. We managed to fit about a boot load of shopping into the cart, including quite a lot of fairly heavy items and I had no trouble managing it, although the kids could only manage short bursts. Our rather pregnant shopping cart is about to give birth! Now, stay tuned for Pumpkin Soup. This entry was posted in Health, Kids learn to Cook, Parenting, Uncategorized and tagged children, community, environment, exercise, fitness, focus, food, health, journey, life lessons, love, mom, mum, parenting, priorities, travel, walking on June 29, 2014 by Rowena. Getting Unstuck…the Greenhouse We Built. Forget The House that Jack Built. The house our daughter built was stuck together with bits of sticky tape…an absolute engineering marvel! With its flimsy walls teetering precariously, it was one of the great wonders of the modern world before it was condemned and rebuilt. Although our daughter is only 8, Miss usually shows more of an aptitude for engineering than this. She enjoys things like mechanics and working on the car with her Dad and usually asks me how things work and likes to put things together properly, unlike her “creative” mother. The sticky tape is my bad influence. I’m the sort of person who cuts corners and used to have staples or safety pins holding my school uniform together…even at a “posh” school. I couldn’t give a damn about how something works. Near enough is good enough. I am more interested in people and what makes them tick. The house my daughter built was actually Jamie’s Greenhouse, part of Woolworth’s Jamie Oliver’s Garden promotion. 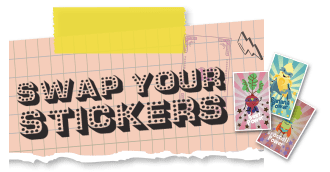 This promotion is based around an informative sticker book for the kids which is literally bursting with all sorts of facts about fruit and veg, games, recipes and is super educational. You pay for $4.00 for the book and then get a pack of stickers for every $20.00 you spend, luring hapless parents and grandparents back into Woollies for fresh supplies. At $4.00 each, this book was an absolute gift and has kept the kids busy for hours doing something other than playing on some electronic life form. These books have spread like wildfire through the schools and the kids are all trading stickers, even if they’re still overlooking the healthy fruit and veg in their lunchboxes. Our daughter asked me to buy Jamie’s Greenhouse, a seemingly innocuous sidekick to the whole campaign. I love gardening and when I saw the package, I was reminded of my previous intentions to start a veggie patch with the kids. This is more of a herb garden but it’s certainly a step in the right direction and preferable to buying yet another soft toy. You see, the campaign also includes a range of stuffed toy fruit and veg and yes I know I could have said no and bought our daughter nothing at all but we all know that’s not how it works. Anyway, while Jamie’s Greenhouse came disguised in cute cardboard packaging covered with child-like drawings, it is what it is. It’s an Ikea flatpack in kiddies’ clothing…only this time it is your child who is supposed to do battle with the bits and pieces building an entire house…not just a bookshelf or a desk. That’s right. They get to build an entire house out of a few flimsy bits of plastic. Actually, constructing this Greenhouse is making an Ikea project look very Simple Simon . After all, when you go to Ikea, you don’t buy an entire house in their trademark flat packs and have to put it together before you can get a good night’s sleep. Of course not! You just buy “bits”. The only piece of furniture which I’ve ever been game enough to buy from Ikea was a humble desk. In other words, a single piece of furniture. My Dad was much more adventurous. He actually bought a table and 6 chairs and almost gave up his day job to put them all together. So much for running his business! Of course, no one ever expects us to be a linguist and actually pronounce all those luxurious Swedish product names, which is where my skill set naturally lies. I find it much easier to speak convoluted Swedish than work out how A slots into B. I have no spacial skills or engineering capabilities whatsoever and still can’t find A or B when I bought that desk back in high school. While Jamie Oliver’s Greenhouse doesn’t come with an Allen key or any other kind of doobywacker tool, as I said, it does come in a flatpack. There are plastic sheets, an instruction booklet, dirt and seeds and stickers to cover up your mistakes. While I did mention something about constructing a “house”, I must confess that we’re talking about a small greenhouse. Indeed, you could say it is the doll’s house of greenhouses. Indeed, it reminds me of the Fisher Price Doll’s house my daughter had as a two year old before her dolls moved into their grand 2 storey mansion along with a considerable amount of accumulated flotsam and jetsam. Those dolls can barely breathe in there, let alone stretch their legs. Well, my daughter has never been to Ikea and she certainly knows nothing about Allen keys or impressing your friends with your impressive DIY prowess. She was being pragmatic and stuck it together with sticky tape instead of putting the slots together. It was now up to me, or should I say Geoff to save the day. I did have a go but I’m more of a sower than a builder. He had it knocked up in no time. This greenhouse was going to weather life’s storms. Now, it was time to sow the seeds and once again our daughter took charge of HER project. This was where Jamie’s Greenhouse really impressed me. It had this special dirt. She added water and the dirt swelled up to double, even quadruple its size. There were little packets of seeds with all those garden herbs we’ve always intended to plant but had always put off. Everything we needed to start a garden was in the box. We planted the seeds. Added water. Remembered to water them and experienced almost instant gratification. 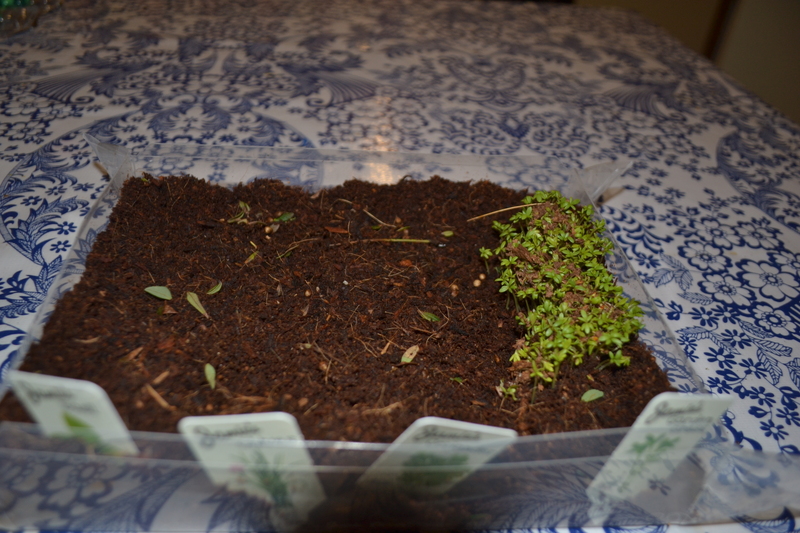 Two days later, we have cress. 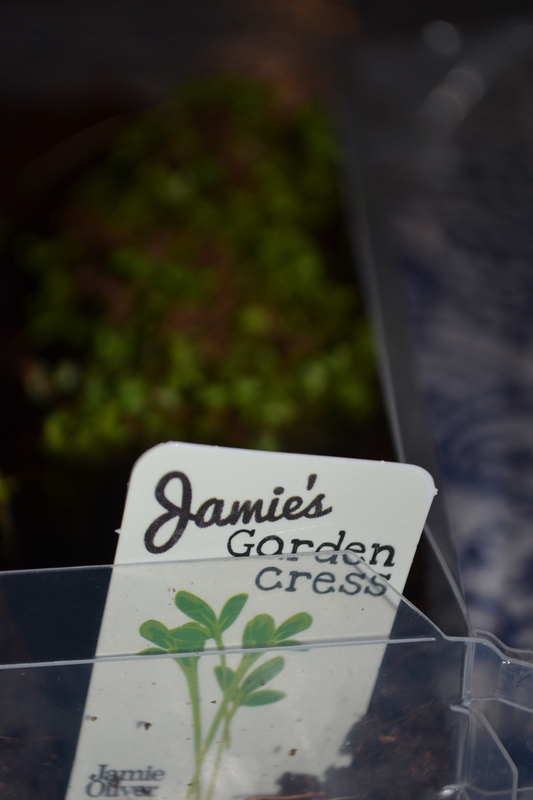 Cress is the perfect seed to plant for kids who need instant gratification. Last night we had some very strong winds and although the roof blew off, the house is still standing and it has made it through today’s winds unscathed. I’ve got to say that Jamie Oliver has more than just a pretty face and when he’s finished at Woollies, he should give Ikea a call. I’d love to get a real live chef thrown in with my next desk. This entry was posted in Parenting, Uncategorized and tagged Australia, backyard, blokes, building, construction, Dad, DIY, gardening, greenhouse, herbs, Jamie Oliver, mom, mother, mum, parenting, sowing, veggies, Woolworths on June 27, 2014 by Rowena. You might recall that we had Irish Night a few months ago to commemorate when one of my Irish ancestors arrived in Sydney 160 years ago https://beyondtheflow.wordpress.com/2014/06/06/irish-nightcelebrating-a-journey-from-cork-city-to-sydney-1854-2014/. Well, we were going to use my grandfather’s birthday as a catalyst for sharing my German heritage with the kids. My mother’s family has German ancestry and in 1992 after I finished university, I actually lived in Heidelberg, Germany for about 8 months with a German family. Moreover, in addition to wanting to share my cultural heritage with the kids, these cooking projects are also part of my ongoing efforts to teach the kids how to cook. This process has taken quite a holistic approach as we’ve moved beyond simply trying to replicate a meal or bake cakes and biscuits, to learning more about the ingredients themselves, nutrition, caring for the environment and also the meal’s cultural heritage. It’s amazing just how much both you and your kids can learn simply by cooking a basic meal. Of course, any kind of cooking and eating, involves bonding and that never goes astray especially in our frenetic modern world. In too many households, the family meal is on the endangered species list. Just to explain our German heritage. My grandfather was a Haebich born in the German-Australian town of Hahndorf in the Adelaide Hills, South Australia. While his Paech and Hartmann ancestors had arrived onboard the first ships of German immigrants back in 1838, Johann George Haebich and family had arrived a little later in 1846 onboard The Patel. George Haebich set up his blacksmithing business in Hahndorf’s main street and in the late 1850’s and built the family home which is known as “Haebich’s Cottage”. It is a substantial ‘fachwerk’ (basically a timber skeleton with infill of pug [straw/mud], brick or stone) cottage. This was where my great grandfather was born and it provided quite a family hub, along with the blacksmith shop next door. We are very proud to be able to point to Haebich’s Cottage and say that’s where we’re from…or, at least, that’s where a part of us came from. The house is no longer in the family. Up until World War I, the Adelaide Hills and the Barossa regions had pretty much been a German enclave within Australia and a mixture of German and English were spoken. Anti-German sentiment during and post WWI, suppressed much of this German heritage and Hahndorf had its name anglicised to Ambleside and it was only changed back around 1938 to honour the centenary of German settlement in South Australia. 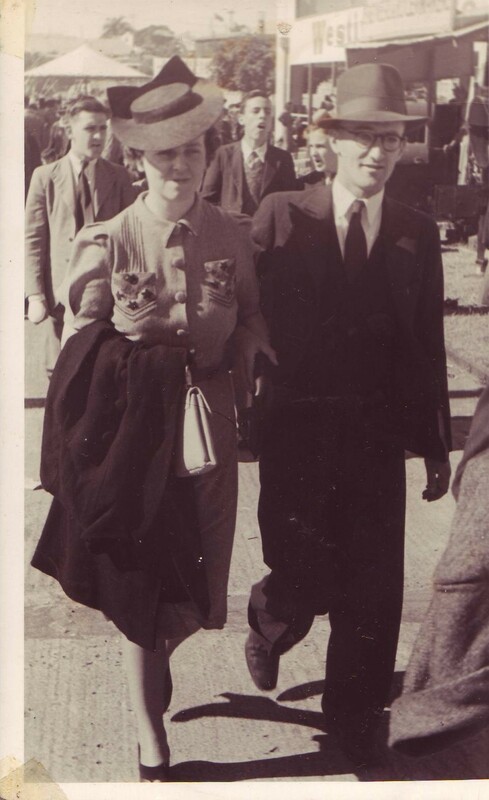 We believe that my grandfather’s parents spoke German at home when he was quite small but as WWI progressed, they started speaking English instead. This became apparent as Papa aged and sunk deeper and deeper into the ravages of Alzheimer’s Disease and he spoke more and more German before talking less and sleeping more. As much as I love German food and we had liverwurst on rolls for lunch and made Honey Biscuits, as the day drew closer, I realised that these German main courses didn’t resonate with me and were quite foreign. They weren’t what my grandfather ate. His favourite meal was undoubtedly Honey Prawns from the local Chinese takeaway. They appealed to both his love of seafood and his incredible sweet tooth. While it would have been easy just to order takeaway, that defeated what I was trying to achieve, share, convey. No! We had to have something home cooked. After all, isn’t there something magical even mystical about home cooking? As any home cook will agree, it has to do with that special, magic ingredient… love. Love pours straight from our hearts and into the saucepan, mixing bowl or the old battered roasting dish, binding family together with glue. That is, unless you want to be purely scientific and say it has something to do with our genes. There is also something extra special about celebrating those precious, special occasions in your own home where the photos almost talk to you through the glass and their aged frames and several lifetimes of tea cups, table cloths, precious read and re-read books all morph together into some kind of memory soup. Memory soup is a regular on our menu both because I have always loved those extra-special, old family stories and have wanted to share them with our kids. I have also wanted our children to know where they come from…the much bigger picture. Our family tree is a huge, sprawling giant with massive branches spreading from Sydney to Perth, Tasmania, Queensland, South Australia, Victoria and back to Ireland, Germany, Scotland, England, Poland and maybe even a touch of France. Surely a tree this big, must have enormous roots which tunnel so deep into the earth that it could never fall down. It is anchored deep into bedrock, giving our family such stability…at least in theory! When you are making memory soup, the dish itself also has to have meaning…deep and personal meaning. Of course, I’m not talking about the roasting dish here but the food…the recipe… itself. This was where I was having trouble. I was struggling to remember what my grandparents ate. Then all of a sudden, like being hit by an ancient Greek thunderbolt or the proverbial flying brick, inspiration struck my otherwise dim and empty head. We had to have Roast Duck. We could only have Roast Duck for Papa’s dinner. While living in Marburg in rural Queensland, my grandfather used to raise and sell ducks to supplement their income and in later life, a beautiful farming family used to drop a duck off for my grandparents each Christmas. However, that’s when things began to get complicated. Of course, this thunderbolt hit less than 24 hours before the big event and although I’ve never cooked duck before, I had a hunch that duck wasn’t easy to find. First thing in the morning (which for us is something like 10.00am) Geoff received his instructions. He had to ring every single butcher in town and beyond until he’d found that elusive duck. Of course, this is the modern, urban equivalent of being “Man the hunter”. That is when the woman sends the bloke off “hunting” for weird or hard to obtain ingredients at the very last minute and, of course, he is expected to prove his manhood by coming up with the goods even if he has to drive inter-state and across the desert and back to succeed. Alas for Geoff’s manhood, things weren’t looking good. Although there are families of ducks inhabiting practically every street corner and puddle where we live, “eating ducks” are actually rather scarce and considered a luxury. Apparently, you not only have to order them in, you also have to give a week’s notice. No such thing as an instant duck…or so I thought! However, Geoff persevered. He found a butcher with frozen duck breasts and some sort of mysterious cooked duck. I didn’t quite know what a butcher was doing with cooked duck but duck was duck. We were on our way…Quack! Quack! Well, this so-called cooked duck was interesting stuff. 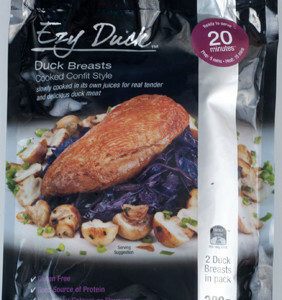 The duck came in a plastic packet and you just emptied the contents into a roasting dish and cooked it for 15 minutes and then finished it off with 8 minutes under the griller to crisp the skin. It was too easy especially for your truly who has never roasted a duck before. I felt a bit guilty cheating like this and wondered whether I was being a little wicked. I mean it was my grandfather’s 100th birthday party an event you associate with traditionand going to great effort, not whizzing up some new fangled instant roast which comes in a plastic packet. It seemed to be the roast you have when you don’t have a roast. Or was it? 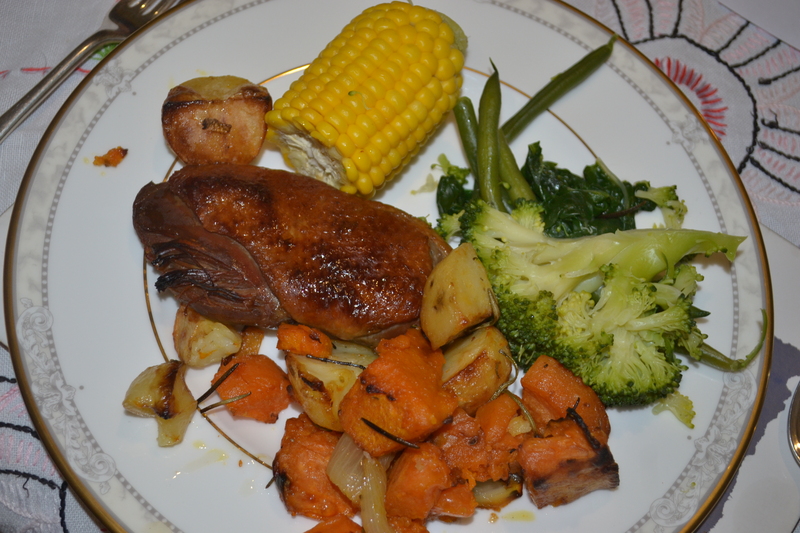 Our roast duck served with the types of vegetables Papa used to grow in his garden. Actually, our funny fangled duck actually appeared almost perfectly traditional. All the same, you’ll have to agree it was smarter than your average duck. Stay tuned for more about our birthday celebrations and last year’s trip to Hahndorf retracing Papa Bert’s footsteps. This entry was posted in Baking, Kids learn to Cook, Love, Uncategorized and tagged Australia, Barossa Valley, cooking, duck, family history, German, Germany, Haebich, Hahndorf, heritage, history, Lutheran, mom, mum, parenting, recipe, travel on June 17, 2014 by Rowena. While St Patrick’s Day is usually the day when we celebrate all things Irish, we had a special Irish celebration of our own tonight. You see, we celebrated the 160th anniversary since our ancestor John Curtin arrived in Sydney onboard the Scotia on the 4th April, 1854. He was an Able Seaman and worked on board as part of the ship’s crew. Not only did we celebrate his journey from Cork to Sydney, we also celebrated the end of a quest because it’s taken our family well over 30years to find the record of John Curtin’s arrival in Sydney. It’s been quite a frustrating business not just because we wanted to know more about how we arrived here but also because knowing when your ancestor came out to Australia is one of the very basics of family history research. If you want your research findings to have any kind of credibility at all, you need to know when you’re ancestor came out. That’s just basic, simple Simon stuff and we couldn’t find him. It was yet another gap and it certainly detracted from researching the Curtin family. I had other branches of the family history which were bursting with fruit. I didn’t need to waste my time with such a barren stump. I moved on yet there was always this nagging gap. How did John Curtin get to Australia? Although we have quite an assortment of ancestors who have come from Ireland, Germany, Scotland, England, we haven’t celebrated any other arrival in quite this way, although we did take the kids down to Hahndorf in South Australia last year to see where my grandfather was from. He was a Haebich as in Haebich Cottage and his father, grandfather and great grandfather had all been blacksmiths in town. 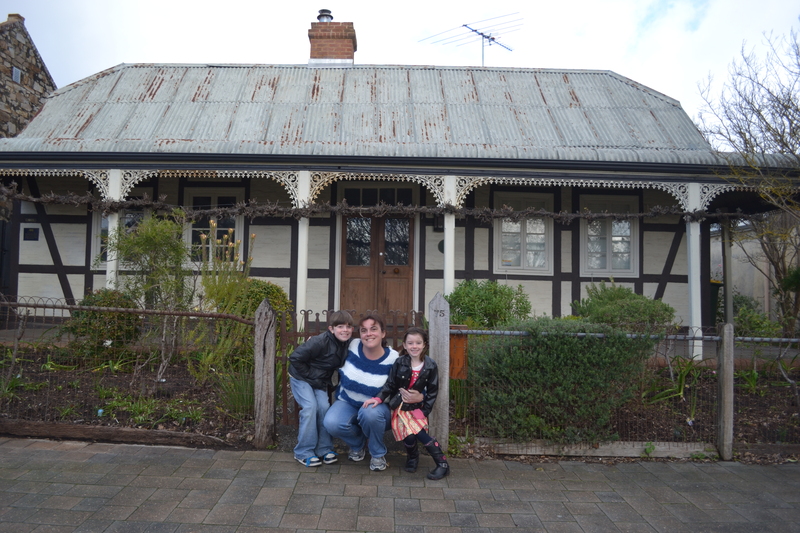 We have also taken the kids to London Bridge, near Queanbeyan to see where my great grandmother came from . You could say that I’m addicted to family history and I want to share this love with the kids and also give them a sense of who they are and our family’s heritage or story. Anyway, we have been looking for John Curtin’s arrival since 1984 and I only found it two weeks ago. I’d really given up any hope of ever finding his arrival and we’d pretty much decided that he’d come out as crew and we were never going to be able to find him because the lists are all about passengers, especially assisted immigrants. All good things come to she who waits. Well, actually they come to she who never gives up because I decided to have yet another look and fortunately some very nice people have been transcribing the shipping lists and low and behold they have actually added the crew! Thank you! Thank you! Thank you! So when it came to actually finding John Curtin now, it only took seconds along with a few minutes for me to do the maths. Because there is such little detail about this John Curtin, we can’t be entirely sure that he’s ours but cross-references work out and it’s good enough. Anyway, as I was doing my research, I realized that we were rapidly coming up to the 160th anniversary of his arrival and I wanted to do something special to celebrate. Ideally, I would have got my Dad’s family together. However, we didn’t have enough notice and now our family is fighting off a chest cold so we’re in no position to socialize. We’re actually wearing face masks round the house as a chest infection could really be bad news for my lungs and in general as my immunity has been repressed to contain my auto-immune disease. So that’s a little bit of background to our Irish night. I decided to have an Irish-Australian menu. So we had Irish Stew served with buttered Irish Soda Bread followed by Pavlova for dessert. I printed off the Irish Blessing and we said that together in lieu of grace. Of course, we needed a bit of Irish music so we put on Riverdance. I also put on a bit of a slide show of images of Cork City and Sydney dating from 1854. I really recommend you do something similar to share your cultural heritage with your children. In the past, Australia has been a bit closed to cultural diversity and we needed to assimilate but now we can bring all our assorted ancestors out of the closet and celebrate who they were and indeed what is a part of ourselves…our very flesh and blood as well as our cultural heritage. However, like most great things which are considered uniquely and indisputably Australian, there’s often a foreign element. Hey, even Vegemite and the Australian Women’s Weekly are foreign owned. So it also appears that the Kiwis (AKA New Zealanders) are trying to take over our pav. Is nothing sacred?!! That said, a pav just isn’t a pav without kiwi fruit on top so I reluctantly got to give the kiwis a bit of credit. This recipe comes from Margaret Fulton who, now aged in her 90s, has to be considered the Grandmother of Australian cooking. I grew up cooking from her cookbooks as a child and even though we have never met, she feels like some kind of surrogate cooking Supergran and I’m sure most Australian women would feel much the same. So much more than a name, she’s part of the family, albeit on the shelf. This pavlova is my signature dish. It is relatively simple but I always receive gushing praise and have somehow become the “Pavlova Queen”.. With its crisp crunchy crust and soft marshmallow interior, it’s amazing and I find so many people truly love pavlova and nothing compares to the classic home made version. It almost makes everybody deliriously happy. This recipe comes from Katherine and I apologise for pilfering her recipe but I have translated it into Australian and will give her credit when I’ve found her site again. I’ve never tried authentic Irish soda bread so I have no idea what it’s supposed to be like. Unfortunately when I made this for our special Irish celebration tonight, I was rushing to get the pavlova into the oven and as a result neither were cooked properly. When I sliced into the bread, it was still raw in the middle and because the pavlova was now cooking in a very slow oven, I had to use the microwave to finish the job off and nuked it for 5 minutes. No doubt, I would have been tried for murder in Ireland for committing such a crime but the bread seemed to recover and went well with our Irish stew. The family all enjoyed it whether it was authentic or not. Pre-heat oven to 230 degrees C . Wait until oven is hot before you add the bread. Make a well in the centre of the flour and pour in about 2/3 of the milk. Quickly and with a light touch bring the flour in from the sides and mix with the milk, until al the ingredients come together into a dough. Use your hands for this, never use a spoon or mixer. It is impossible to be exact about the amount of buttermilk needed, it will depend on the nature of the flour. The dough should not be sticky and should come together into one lump of of soft, slightly floppy dough. Place on a baking tray. Dust the handle of a wooden spoon with flour and press into the dough to form a cross. This gives the bread its tradition cross-shape and also helps the bread to cook through more easily, although I have read that this is to let the fairies out. This process should only take 5 minutes and you need to get the bread in the oven immediately. Quick. On your marks. Get set! Go! Set timer for 5 minutes. Turn the oven down to 200 degrees C The initial high temperature ensures a good crust. Set timer for a further 20 minutes and take the bread out and knock on the bottom. If it sounds hollow, it’s done. If not, pop it back in the oven for a further 5-10 minutes and check again. This bread should be eaten on the day that it’s made which shouldn’t be a problem. It also makes good toast. Cook your pavlova well before bake your bread. Pavlova might be a dessert but it needs an hour to rest in the oven after cooking for you do need to allow quite a bit of extra cooking time and the pavlova didn’t like me mucking around with the oven temperatures either. I am known for my pavlovas which have a deliciously crunchy crust with soft marshmallow inside. This pavlova decided to be fussy and it had no crunch at all and was pure marshmallow which still tasted great but it wasn’t the same. This entry was posted in Uncategorized and tagged Australian History, baking, City of Cork, Cork, Curtin, family history, history, ireland, Irish, Irish Cooking, Irish Soda Bread, Irish Stew, Pavlova, ship, ship's crew, shipping, Sydney on June 6, 2014 by Rowena. This entry was posted in Baking, Kids learn to Cook, Uncategorized and tagged baking, cooking, family, food, health, love, mom, motherhood, motivation, mum, parenting, photography on June 6, 2014 by Rowena. It was my mother’s birthday this week and it might have taken me almost 45 years, but I finally managed to get it right. Went without a hitch this year. Of course, we all know that birthdays, Christmases and other special events where we all intend to be loving, thankful and focus only on the good, so easily backfire into tears, hurt,arguments and disappointment…and that’s in your well-adjusted family! With all this drama and backfiring good intentions, it is very tempting to question why we celebrate special occasions at all. My personal explanation is that we celebrate these special occasions so we can put aside a chunk of time for someone we love, someone we always believe is special but for whatever reason, it is often hard for each of us to make time for each other…especially at the same time. It’s hard enough when you are living under the one roof but really quite tricky when you don’t. Birthdays are like the red light for all other traffic and a green light with all roads heading to the birthday person. Birthdays force us to follow through with all our good intentions…at least they should! My mum is what you could describe as publicity shy so like the Oral B dentist, I can’t show her face in this post. I would, however, like to thank a friend of mine Mary who always bakes enough biscuits for an army whenever there’s a function at Church. Church was having a morning tea and garage sale type thing when I was on the way to buy mum a German tea cake, which we particularly like. Anyway, I brought home a few cupcakes and these decorated Milk Arrowroot Biscuits which helped turn our afternoon tea into a real party-especially for the kids. Of course, I succumbed to buying some of the treasures at the garage sale too. This included finding a teacup, saucer and plate for mum with snow bells on it. Finding this on Mum’s actual birthday was very meant to be. My grandmother had snow bells in her wedding bouquet. 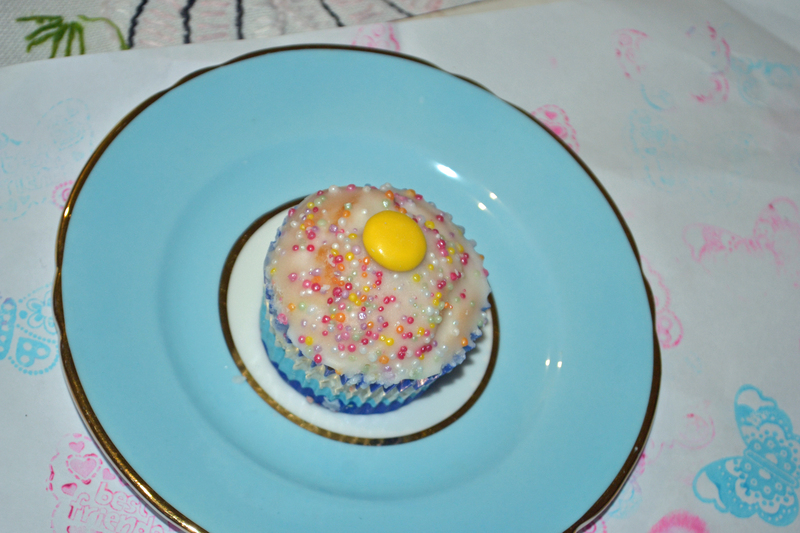 This entry was posted in Baking, Love, Parenting, Photography and tagged birthdays, cooking, food, happiness, healing, kids, love, mom, motherhood, mum, Mummy, parenting, photography on June 6, 2014 by Rowena.